A BID to give increased protection to a Northumberland school and nearby homes which were threatened with a controversial mobile phone mast has been given top-level approval. Anger erupted last year over two separate attempts by telecommunications giant O² to erect a phone mast on The Broadway in Darras Hall, Ponteland. The company eventually agreed not to go ahead after hundreds of placard-carrying locals staged a silent protest outside Darras Hall First School. Subsequently 1,800 residents signed a petition calling on Northumberland County Council to take action to make it more difficult for phone companies to put up a mast in the neighbourhood. Earlier this year councillors agreed to use special planning powers to seek a direction under Article 4 of the Town and Country Planning Act in a bid to give added protection to The Broadway. Now the order has been confirmed after no objections were raised by the Secretary of State, O², or any other interested parties. It removes permitted development rights for telecommunications equipment in the area, and gives it increased protection against phone mast development. 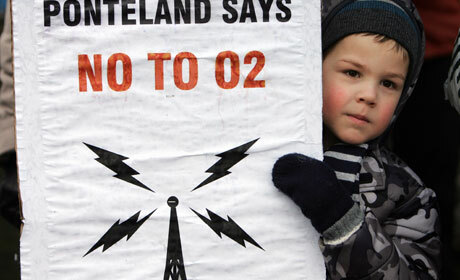 It means companies such as O² would need to secure full planning approval from the council to put up a mast. The saga began last year when a county council mistake resulted in O² getting planning permission by default for a 12.5 metre-high mast outside 450-pupil Darras Hall School. An alternative site further along Broadway was then refused planning permission, leaving the company free to put the mast next to the school. However, O² agreed to seek a less sensitive site in the wake of the massive public demonstration held in February. The Article 4 direction was sought to restrict permitted development rights, and address local fears that another telecoms firm could return to the school site and implement the outstanding planning consent. Yesterday Richard Dodd, who represents Ponteland North on the county council, said seeking the order had been the only option to protect the school site and The Broadway from telecoms development. He said: "It is all quiet on the western front as far as O² are concerned, but we also have to worry about who or what comes next. Darras Hall School and The Broadway is a sensitive area and the order is a tool which gives us more control over what happens there." Planning rules say an Article 4 direction can be made where there is a "real and specific threat to the locality in which the development is to take place". There needs to be a compelling case to justify such a move.